This is it. The one we’ve all been waiting for. Avengers: Infinity War! Eighteen movies have led up to this point, the culmination of the entire Marvel Cinematic Universe. We first saw the villain, Thanos, all the way back in Avengers 1 in 2012, and with a major role in Guardians of the Galaxy. Now, he’s back and badder than ever, wielding the universe-destroying power of the Infinity Stones, and it’s going to take all of the Avengers to stop him. It’s a wild ride. Full of action from start to finish. Its biggest flaw is that you have to have seen so many of the earlier movies to understand it, but if you have, it’s very well done, especially the ending. To make sense of Avengers: Infinity War, you have to understand Thanos. In the comics, Thanos is just this crazy guy who wants to kill as many people as possible to get Death—that is, the personification of Death—to fall in love with him. But that sounds far too campy for the big screen. Some fans had speculated that Hela from Thor: Ragnarok would be a stand-in for Death—seeing as she is, you know, the Norse goddess of death. But Hela’s desire was merely to conquer, not to kill, and also, she’s dead herself. No, this Thanos is not courting Death, despite the teaser at the end of Avengers 1. Instead, he wants to “balance” the universe, which really means he wants to solve the problem of poverty and limited resources by killing half of all the intelligent beings in the universe. It’s still crazy, but at least there’s a reason for it. And it’s a surprising and fascinating change to see that this guy whom we’ve always seen just being evil actually cares deeply—just in such a twisted way that he’s become the enemy of all life. Anyway, Thanos has been slaughtering half the population on planet after planet (for thousands of years in the comics), but with the Infinity Gauntlet powered by all six Infinity Stones, he can do the job with a literal snap of his fingers. And in fact, he does. 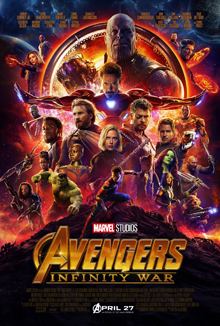 At the end of the film, Thanos assembles the Infinity Stones and snaps his fingers, and half the people in the universe, including many of our protagonists, turn to dust. And Thanos rests, his work finished, and watches the sunrise. I really admire stories that don’t pull their punches like that. We’ll find out how our heroes get out of that mess in Avengers 4 one year from now. It’s certainly implied that Thanos’s victory is part of Doctor Strange’s grand plan—the one future where the heroes win—perhaps getting him to let his guard down so they can get a hold of the Infinity Gauntlet. And we know that in the post-credit’s scene, Nick Fury calls in Captain Marvel, who is getting her own movie next March. And Ant-Man and the Wasp also premieres before then, so don’t count them out yet. I don’t know the full picture, but I have a feeling all of these factors will be in play, and I have one more prediction, that Gamora will come back after they throw the Soul Stone back into the pit on Vormir. I do know that I’m eager to see what happens. The other thing I thought was interesting was Captain America’s assertion that “we don’t trade lives”. At first, I thought this was monumentally stupid with the fate of the entire universe at stake—like Cap’s juvenile, Boy Scout-ish desire to leave no civilians behind in Age of Ultron, taken up to eleven. But on closer inspection, I think there’s more subtlety to it than that, because we actually see both sides of the equation in Infinity War. Edit: on further reflection, Thanos is so powerful that he might have still been able to get all the stones by brute force anyway, except perhaps the Soul Stone. We see Loki trade the Space Stone for Thor’s life after initially holding firm. But we also see Star-Lord sacrifice Gamora to protect the Soul Stone, only for Thanos to stop him with the Reality Stone. Gamora trades the Soul Stone for Nebula’s life, and then Doctor Strange trades the Time Stone for Iron Man’s life, but this might have been part of his master plan. And finally, Scarlet Witch initially refuses to sacrifice Vision to protect the Mind Stone, but she ultimately accepts the price and destroys it, only for Thanos to stop her with the Time Stone. We see many variations on this theme, and while some of them are objectively stupid, it’s interesting to see how the film plays with it, and I think Scarlet Witch’s sacrifice of Vision, not Cap’s reticence, is really the defining moment. This entry was posted in Movie Reviews and tagged Avengers, Avengers: Infinity War, Marvel Cinematic Universe, MCU. Bookmark the permalink.